These are so adorable! They are the perfect size for gifting small items, or making small air plant terrariums. The quilted etching/texture on the jar is really nice, and makes it look a bit fancier. They came in a well-packed box, all sealed in plastic with no damage. I bought these at a fantastic price afew months ago. Being new to canning I didn't want to invest a lot of money into something I might not use. I was thinking of making some jam/jelly but, settled on making homemade crockpot apple butter. I like the quilted look of these 8oz. jars they look prettier than just clear jars. I made my apple butter in the span of 24hrs and the jars worked beautifully! I put them in my dishwasher to sanitize and processed them in a water bath with minimal effort. The tops as far as I can tell have sealed nicely and I could hear them &quot;pop&quot; as they cooled! Very thrilled with my purchase! These are pretty good, just be aware of a few things :1. SIZE: An 8 oz mason jar is small. If you're looking for something for a smoothie or salad, get 16 oz. If you want something very large to contain what you juiced (old fashion milk carton size) I would suggest 32 oz or higher. This 8 oz size is good for making and storing jams, making chia pudding, etc.2. The lids tend to get rusted over time, especially the ring. They don't do well in a dish washer. The glass jar itself does great in a dishwasher though and I haven't had any cracking or breaking issues yet. Have had these for a year now. I bought these to use as Candles.. I make small emergency candles and Bug off candles using soy wax and Essential oils. These I have found to be the perfect size for what I need them for, and they are meant to withstand heat so there is less of a chance of them shattering if warmed slowly as they would be with a candle. These are perfect for making little snacks! I have no idea how to can things so I'm not using these for that purpose... but for anyone else out there who is dieting I'm finding these SO useful for portion control for snacking. Whether its a single serving of homemade hummus, crispy lentils, vinegar and yogurt based coleslaw, whatever, these little 4oz jars are the perfect size to ensure I limit myself to a small amount. And the smaller vessels tie into that dieting trick where using a smaller plate/bowl makes you think you're eating more food. Also, the lids make them ideal for snacking on the go. I'll fill a couple of these with some healthy goodness and just toss them in my work bag and I don't have to worry about anything spilling (I've had a few disasters with that... especially with soup - yikes!). Seriously, these jars are SO useful and I can only imagine what other purposes for them I'll discover the longer I have them. They are definitely my new favorite item!!! FYI, for the dieters, I'm finding that the 4oz jars hold roughly 1/2 cup of stuff - I've only used it for hummus and lentils as of yet, but that's approximately how much I can fit into the jars. I use these jars for EVERYTHING! I love them! I run my own Etsy shop and I have been able to use these for body scrubs, makeup remover wipes, coffee scrubs, and more. I love the size because they are not too big, but not too small either. They come with the 4 oz glass jar and a twist on top which is in two pieces. You can either use just the twist on outside metal part of the lid or both the outside part and the center plate which helps keep it sealed and keep whatever you put inside fresh/clean. These would also work well for small jars of dips and spreads if you wanted to do a gift basket or something with smaller amounts. 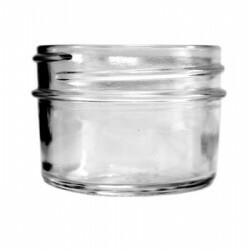 The glass jar part even has some nice quilted style patterns on it that give it a little something different.They are great quality and very sturdy so you don't have to worry too much about them breaking. I will absolutely be ordering more soon! I love these 'cute' little ball jars. I bought this set for my spices. I love to cook and I have LOTS of spices and herbs and they were everywhere! I have to give a shout out to 'savory spice shop' because I have been buying my spices online exclusively from them for years and they are THE BEST!!! Spice jars are expensive and some are so small they are useless. These are perfect! They look retro to me but I can see these in a modern kitchen with the touch of silver (or use a different color lid- they have them on Amazon. )These jars stack easily, but no more than two. The glass is beautiful and allows you to see what is inside. These were typically called 'jam jars'- but I can see so many other uses with them.When I buy my spices I buy them in 2 or 4 ounce bags. These bags come with labels that have pertinent information on them. What I did was cut around the spice label I needed, insert that into the jar, fill the jar with the spice, then put a 'ball' label specifically made for these 4 ounce jars- It was a lot of work, but my goodness no more playing 'try to find the spice'... Everything is in order, and the spices will keep longer.It was one of my New Years resolutions- and I am ¾ of the way done! I need another 24 jars and I will be onto the next organization job. I loved these jars! I got them to hold chocolate candy sea shells for wedding favors and they worked out perfectly. The lids fit the wedding circle stickers on wedding paper divas exactly! They were a great size, not too much but not super small either. I love them because they are reusable after the wedding. I had some left over so I used them to make homemade candles. They worked well for this as well! I didn't use the labels that came with them, but this was a nice touch and I'm sure I will find a use for them in the future. I may have dropped more than one while working with them, in addition to being thrown in a box to move to the venue, and did not have a single one break. They came safely packaged as well. The Jars were perfect for what I required. The delivery was quick and packaged well. Fantastic products, great prices and speedy delivery. Only complaint is that Ball do not give a guide to freezing in their freezer proof jars with the product - it would be handy as freezing in glass is very different! I busted the jar the first time, but it went well after I googled a few things on the net. Great for jam! Small size means a great gift size or for more unuasal condiments you might not eat every day. The lids on these are really pretty, would love to buy them separately. I use these jars mainly for pastes, tomato, quince and damson. They are the perfect single use for the tomato paste. Our cheeseboard/platters also look rather special when the paste is able to be served either in the jar or unmoulded beautifully in the shape of this jar. I also love how these come with labels and that the water soluble labels are also the right shape to be used on the space on the jar. Excellent. Great jars - perfect for my candles! My order arrived promptly and very well packed - no broken jars! Very happy customer, highly recomended. Wonderful product, most suitable for my crafting purposes. Love these jars, they keep all my homemade spices fresh and great for small servings of yoghurt etc. great service and delivery...thank you. These jars are fantastic - good size for jams, lemon butter, relish etc. Fast shipping &amp; careful packing by Ozfarmer gets two thumbs up! These little jars are beautiful - I love them for serving pudding, carrying snacks in my hand bag, and of course giving away as gifts filled with home made jams. I'm very happy with my purchase. Perfect size for individual servings. I am using them to make my own yogurt. Thanks again. Jars were great, perfect size and very quick delivery. Thanks so much. Fantastic jars - perfect for filling up with chutney, jam, sauce and other things. I'm using them for Christmas presents. My jars arrived last week and they are already all filled up with yummy tomato chutney. Great size and the jars are just like the ones my gran used to use - perfect. 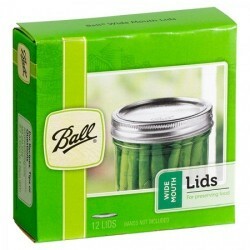 Ball Regular Mouth Quilted 4oz (120ml) Quilted Crystal Jars are ideal for fresh preserving recipes such as jams, jellies, sauces, mustards and flavoured vinegars. The Quilted Crystal design adds a decorative touch to these multi-purpose jars also use them for serving creative decor and gift giving.